Welcome to the worlds best guide to Women's Cotton Crew Neck Tees. Are you actually looking for Women's Cotton Crew Neck Tees? Well, we hope you are because the reality is that you have found our page on the subject. A crew neck (or crew-neck) is a type of shirt or sweater that has a round neckline and no collar. This top can be worn on its own or with other layers. The T-shirt crew neck was developed in 1932 as an undergarment that would absorb sweat. When we talk about a "tee" it should not be confused with a tee that is used to support a stationary ball so that the player can strike it, particularly in golf, tee ball, American football, and rugby. On this website when we mention the word "tee" it is an abbreviation for a t-shirt. A T-shirt (or t shirt, or tee) is a style of fabric shirt named after the T shape of its body and sleeves. It normally has short sleeves and a round neckline, known as a crew neck, which lacks a collar. T-shirts are generally made of a light, inexpensive fabric such as cotton or cotton blends and are generally easy to clean (depends on what you get on them). The crew neck tee can come in a variety of colors, lengths, silhouettes, and sizes. You can find this neckline used for short sleeve or long sleeve, cropped, dress-length, midriff, etc. Crew neck are sometimes referenced as U-neck. Cotton is a soft, fluffy staple fiber that grows in a boll. The fiber is most often spun into yarn or thread and used to make a soft, breathable textile. Cotton has numerous benefits that make it an appropriate fiber for t-shirts. Learn about the numerous benefits of cotton. Apparel Search is a leading guide to fashion, style, clothing, glam and all things relevant to apparel. 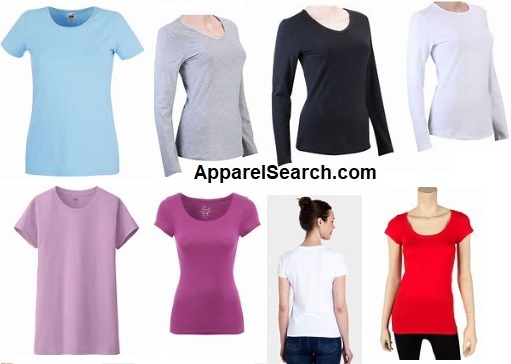 We hope that you find this ladies cotton crew neck tees page to be helpful. If you want to be even more stylish, you should wear your favorite cotton crew neck Tee. Learn about other types of t-shirts.